In a future where humans began to colonize the solar system, the basic vital resources have become more than coveted. Water, especially in its composed or decomposed form, in hydrogen and oxygen, has become the most important resource of the entire solar system. Water allows life, but it also helps to fill the need in energy of futur societies. The hydrogen it contains will be able to feed the thermonuclear fusion power plants. It can be used as fuel for rocket engines. Oxygen will be very useful to recycle the air on board of the transport shuttles, as travel between settlements will always be long, given the huge distances between them. But then, where to take all this water? One can easily imagine that it will be forbidden to refuel on Earth. In fact, given the enormous quantities of water needed for the development of settlements and the constant transport of merchandise and goods to supply them, we would provoke unimaginable cataclysms by upsetting the already fragile cycle of our planet. On the other hand, there are several water resources in our solar system. Since, the comets are made of ice, it would be possible to go on the hunt for comets and change their orbit to bring them closer to the colonies, from where they could be mined. But this complex and expensive process is not without risk. And new data confirm the presence of water on a few moons in our system. It will be easier to collect it and transport it on a more stable ground, and where the quantities are much more abundant at a precise point. The moon that interested us is part of the Galilean satellites orbiting Jupiter, and is none other than the legendary and mysterious Europa. This little ice ball intrigues many since its discovery by Galileo in 1610. Several theories have been made about it. But one thing is almost certain, it is covered with a layer of several meters, see kilometers of ice in some places. It throws ice and water particles into its atmosphere through powerful geysers and has an enormous ocean that could reach 90 km deep, which is more water than our good old Earth. Our concept is simple. Teams of workers in the field of education and training; water, oxygen and hydrogens. They go aboard a gigantic mother ship for a period of up to 6 months. On site, semi-autonomous modules, the Manidaes, wait for them with facilities conducive to their comfort and success of their missions. They bring with them all that is needed, a ground crew that includes between 30 to 60 people, which is made up of scientists to study the seabed in search of traces of life, engineers, technicians, psychologists, all that help keep our workers healthy, physically and psychologically. A team also remains on board of the mother ship, while it remains in Jupiter's orbit, to allow the many back-and-forth movements required to refuel ground troops and to repatriate shipments with the help of secondary shuttles. This can be refueled from the hydrogen production of ground stations. The ocean under the ice can power the hydropower facilities through a device under the thick layer of ice that uses the powerful tides, which is more than 30 meters in some places. The inlandsis (polar cap) is a layer of ice covering the surface and can reach thousands of kilometers in depth. The surface of Europe is composed of ice. Under this layer of ice, lakes of the size of large lakes and an ocean of water potentially containing sources of extremophile life are found several dozens of kilometers away, like the ecosystems of black smokers on Earth. Here is a typical plan of a grouping of several modules connected to each other and forming a micro-city. The possibilities of connection are endless and can be adapted according to the needs. Europe does not have an atmosphere like Earth to block cosmic radiation. The modules are therefore provided with a multilayer system composed of several layers of ice trapped between hydrogenated boron nitride nanotube layers. Capsules can have several functions. Mainly, those on the top and sides of the module serve as housing and their outer surface is provided with solar panels. The capsules below serve as storage for both indoor and outdoor activities. A star complex of 7 modules and 1 central module can accommodate 112 people. Currently, it would take 7 years to reach Europe's orbit. To promote the adaptability of the modules, they are designed with standardized parts easily interlocking together. 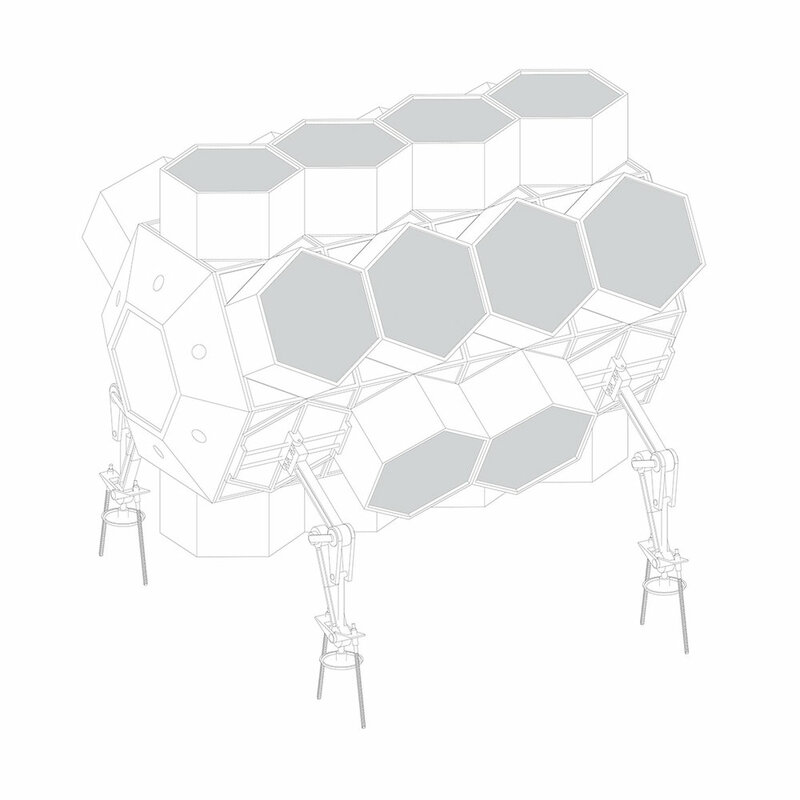 The body of the module is a lightweight and durable exoskeleton that can accommodate, on all surfaces, accessories such as capsules or stabilizing feet. The gravity on Europe is equivalent to our moon, which is about 7.5x weaker than the Earth. In addition, the crust of Jupiter’s moon undergoes important and frequent tectonic movements which mark its surface by a multitude of streaks. To ensure their stability, the modules have hydraulic feet equipped with a load distribution disk and screws anchored in the ground. The capsules of the central module make it possible to store the water extracted from the ground and to make hydroponic agriculture. The central module is the core around which other modules hang to form a micro-city. The latter is the first element to be put in place during the establishment of the colony. It contains a drilling water extraction plant and it is used for various functions such as food, agriculture, the multilayer system against radiation, etc.